There was mass confusion at the end of last night’s Oscar telecast as Faye Dunaway announced the wrong movie as the winner of Best Picture. As explained later by Warren Beatty, who was presenting the final award of the night with Dunaway, they were not given the right envelope before they went on stage. Instead they were given an envelope that said Emma Stone of “La La Land” had won Best Actress. In the confusion Dunaway announced “La La Land” as the winner of Best Picture. The Academy of Motion Picture Arts and Sciences has made YouTube take down almost all videos that had the entire incident, which lasts close to 8 minutes. However, Mediaite has the entire video, which you can watch by clicking here. To see all the winners of last night’s Academy Awards ceremony — along with the nominees, please click here. In the screen-grab above, Warren Beatty (right) explains to Oscars host Jimmy Kimmel how the wrong movie got announced as Best Picture. Why did the Academy take down the videos? Sheesh, the Academy, HEAVEN FORBID, is NOT trying to cover up the news, is it? Hollywood, with all its clams, tears and rants for openness and transparency would never do such a thing, right??? That would be an INCREDIBLE double standard!!! How do you screw up the last award (and most coveted) of the night?? How could there be 2 envelopes with Emma Stone winning best actress? Did the Academy (and ABC) stage this to add more spice to bump up ratings from last year’s horrible viewership? Who knows? But the Academy taking the videos down is RICH !! The biggest issue the academy has with ratings is the fact it is ignoring its ticket buying audience. It chose a film for best picture that has had extremely limited distribution and has not been seen by well over 60% of the country. Then it ignored the nominated movie that most ticket buyers have seen and surveys showed they favored for best picture, by not giving it a single major award. At the same time the Academy patted itself on the back for its new “openness” to blacks. But the movie that provided the most uplifting of black historical stories and gave hope and incentive to every young black girl in the country that she could be anything she wanted to be, was ignored. Also they applauded an Iranian who attacked the American President, but said nothing about his own country’s leaders who endorse the mutilation of women’s sexual organs and execute anyone who is found out to be LGBTQ. That is why the Academy has lost all credibility and the awards are no longer considered must watch TV. 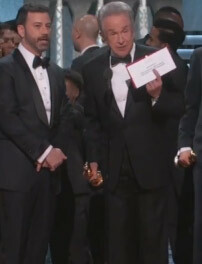 No one is mentioning the accountants who handed Beatty the wrong envelope. It’s time that PriceWaterhouseCooper (PWC) was replaced for mishandling this important duty, by KPMG or Y&R.